$75.95 Includes FREE Shipping in Continental U.S.
• Rated airflow up to 1400 CFM. • Non-woven, 5-inch thick, pleated Air Bear® media filter traps particles as small as one micron. • Tested using ANSI/ASHRAE 52.2 - 2007 standard procedures. • Air Bear® filters capture and hold pollutants inside the filter, allowing air to flow freely through the system. • Available in a wide variety of sizes. • Mounts directly to heating and cooling systems. • Suitable for use with all types of forced-air HVAC configurations. 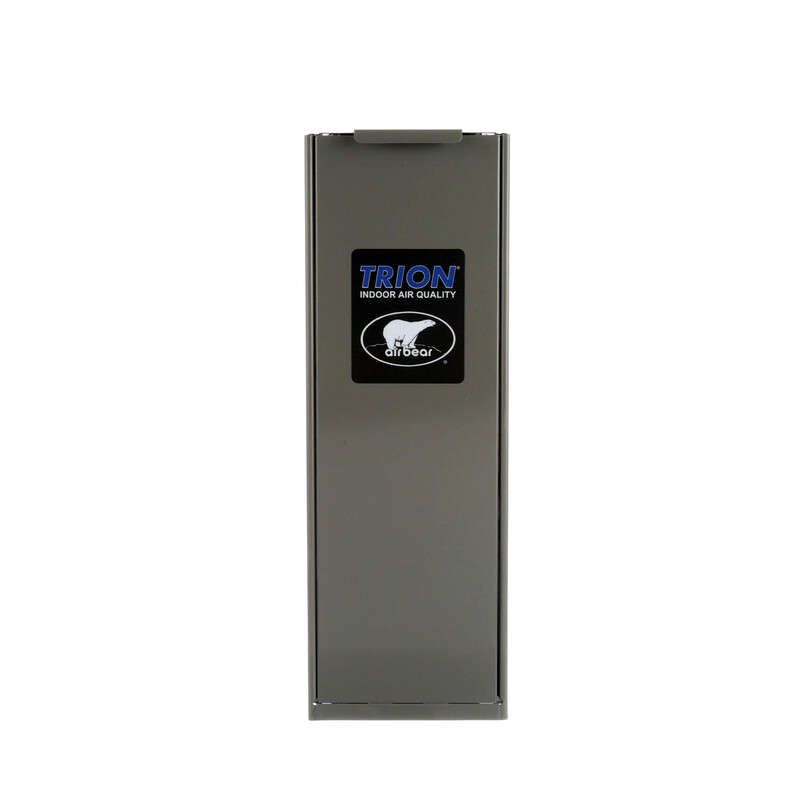 TRION® air cleaners feature media filters that effectively capture large and small airborne pollutants to MERV 8 or MERV 11 filtration standards. High-efficiency media air cleaners can clean large amounts of air while offering whisper-quiet operation. 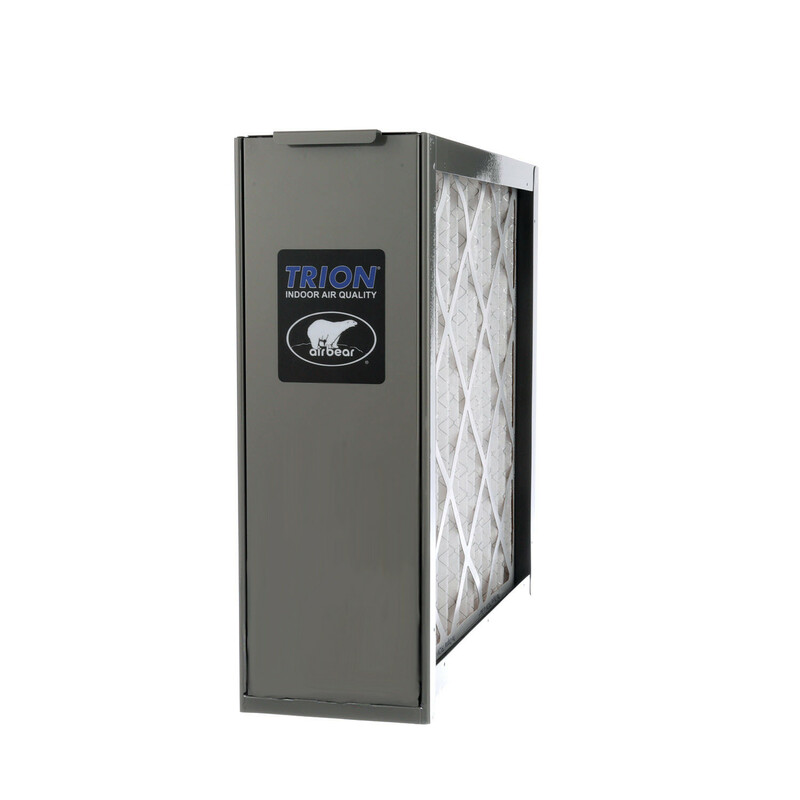 The TRION® Air Bear® line of ducted media air cleaners easily attach to your home’s existing or new heating and cooling unit. TRION® Air Bear® Supreme, Air Bear® Right Angle and Air Bear® Cub media air cleaners offer outstanding performance, effectively removing mold spores, pollen, and other airborne contaminants. Using highly efficient, omnidirectional, synthetic material and an extended surface-pleat filter design, the Air Bear® media filters have been proven to have a higher dirt holding capacity than competitive filters and are over 10 times more efficient than traditional 1” throw-away filters. The Air Bear® Supreme and Air Bear® Cub are both one-piece wrap around, 20-gauge cabinets. The Air Bear® Right Angle space-saving design is ideal for installation situations that require a 90° duct adapter. Air Bear® media air cleaners are available in 5 cabinet sizes, 2 filter efficiencies (MERV 8 and MERV 11), and 3 airflow capacities (up to 1,200, 1,400, and 2,000 cubic feet per minute - CFM). The air cleaner is mounted directly to the home’s heating and cooling system. A high efficiency Air Bear® media filter captures the smaller, invisible particles that are present in your home’s air. Air Bear® outperforms the competition because of its highly efficient synthetic material, radial pleating and an omnidirectional airflow design. It has been proven to have a higher dirt holding capacity than competitive filters. That means fewer filter changes and money in your pocket! TRION® media air cleaners work within all types of heating and cooling system configurations. TRION® whole-house air cleaners can be easily installed and are suitable for use with all types of central forced-air heating and cooling system configurations. They can be installed in up-flow, down-flow, and horizontal configurations.